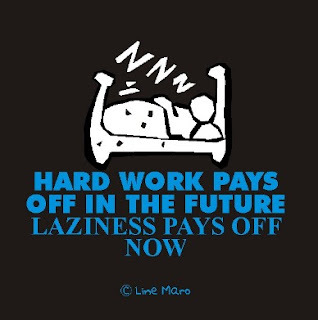 The dictionary definition of Lazy - averse or disinclined to work, activity, or exertion; indolent. But I guess none of us ever had to actually look up Lazy in the dictionary, Majority of us have heard that word used countless number of times, I guess 1 of the real words you really learn as a baby will be lazy or laziness (not in English but surely in your mother tongue). Your mom calling your dad lazy, or your dad calling your elder brother lazy or basically everyone you know calling you lazy. Being called lazy has such a negative connotation to it, I wonder why? Now that I think of it if someone is calling you lazy they are actually recognizing your inner potential. If you really think about it, the world around us wouldn't be the same if it was not for the contribution of some real Lazy people. It's the lazy people who invented the wheel & the bicycle because they didn't like walking or carrying things. Its the lazy person who said lets fit a motor into this bicycle and thus the Motor-Cycle was born. A baby Diaper is an invention to not keep cleaning up after a baby again and again. These new age industry with all its automation and robots, ever thought the concept of a Robot came into being just cause of a person too lazy to do his own work. Don't denounce us lazy people, its said "The best way to get any difficult work done at the shortest time possible is to give the work to a lazy person, He will surely find a way to get the work done in the shortest time in the most efficient way"
Efficiency :- Like I said above, we the lazy people will always find the most efficient way of doing something at the shortest time possible, after all if we are working too hard we can't be lazy right? Think about it, if you people didn't have lazy people like us searching for doing things more efficiently you people would still be stuck in the stone age. Delegation :- what better way not to do work than to delegate? Ever looked at your Boss and wondered, this guy doesn't do anything yet earns double than me, well here is you answer, he is a better manager as he knows to delegate. Stall and Eliminate :- Learn how to stall and procrastinate stuff, the more you stall and procrastinate work you might end up seeing someone else doing that work, or that work itself becoming unnecessary, thus you don't waste time doing stuff which is unnecessary in the end. Quick Work :- Sometimes when you stall (see above), it turns out that the thing you are stalling is really important, and needs to be done. If so, you will find this out when someone else who needs it done gives you an urgent call and 10 emails, asking for it to be submitted. This is when urgency comes into play, and it is a great motivator. You will get the thing done. But that urgency didn't exist until you stalled for a week. So the trick is to wait to do things until the absolute last minute, when you will be super motivated to do them. So don't schedule some of your tasks until the last possible time you could start them and still get them done before deadline. Don't laugh at us you time-starved people of the 21st Century who find that even 24hours of the clock is too less. Learn from us the above qualities and you will find you have plenty of time to do things you actually love. Learn from us, the lazy people, the actually smart people how to do things efficiently and you will find you have got enough time to stuff that actually excite you and not do the boring stuff only. But what am I doing here trying to teach you people what it means to be lazy? I got to go and catch some shut-eye.